It’s no secret that business owners are constantly pulled in a hundred different directions. So it’s no wonder that thoughts about the business’s physical building might fall to the wayside — until a customer mentions finding the office door unlocked one morning before normal hours, or an employee says that they can’t ever seem find parking in your private parking lot. But is hiring an On-Site Officer to patrol the premises worth the cost? 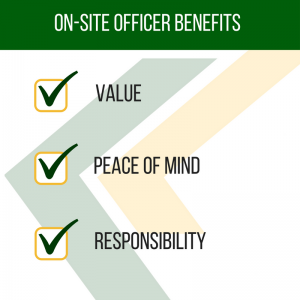 If you’re a business owner on the fence about hiring an On-Site Officer to secure your building, but are put off by the price or the idea of the lazy security guard media so often portrays, we’ve gathered a few handy benefits of on-site security. Similar to how the sight of a professionally monitored security system in a house is statistically likely to deter a burglar, knowing a property is guarded by a trained Officer can provide welcome peace of mind not just to you as the business owner, but to your patrons and employees. Whether the property is in a high crime area, or simply a bustling building with heavy foot traffic, the mere sight of a professional Officer is a deterrent against suspicious activity. Do you need someone to greet guests as they enter the building, check ID badges, give directions or walk your employees to their cars at night to make sure they get there safely? On-site Officers are trained in caring for your customers and helping when needed. When assigned to a post, On-site Officers quickly become experts not only on their surroundings, but on the comings and goings of the people who frequent it. That means they notice when a stranger passes through with an oddly filled backpack, or when a car doesn’t seem like it’s in the correct spot. Not only that, but they learn the quirks of your building — like the partially hidden side door your employees may forget to lock before they leave for the day or the tree that blows in front of you backdoor surveillance camera. They have it covered. Whether they are monitoring your company’s surveillance system or performing a foot patrol around the building, On-site Officers are trained — ours are certified by the State of Oregon private security regulatory body as industry professionals — to recognize red flags, prevent potential crimes, and help ensure the correct action is followed in stressful situations. Making sure your property is safe and secure is their job. Contact us here to learn more. Despite the bumbling, donut-feasting, highly inept security guard that the media often portrays, the real-life On-Site Officer is anything but. From the second they clock to the moment they leave for the day, it is an On-Site Officer’s job to cover a variety of duties as chosen by the owner or property manager. But it goes beyond the expected foot patrol, hard checking exterior doors and monitoring for disturbances — an On-Site Officer is just as often a security surveillance monitor, a comforting presence in stressful situations and a friendly face providing customer service to those who need it. Below you’ll find a snapshot of a typical day in the life of an On-Site Officer in the Beaverton/Portland area, a report similar to the one every one of our clients receives at the end of a shift. Please note: No donuts were eaten in the creation of this report. On site and on duty at 0856. Checked in with First Response Dispatch. Retrieved keys, badge and site phone from security office. Began patrolling the shopping center. At 0912 I gave directions to a visitor looking for a Doctor’s office in the shopping center. At 0959 hours I found a piece of paper on the walkway that appeared to be confidential patient information. I returned it to the front desk at the Doctor’s office. At 1011 hours I issued a parking violation to a vehicle with no visible DMV placard parked in a disabled spot. I documented the vehicle with a photograph. At 1028 I returned to the security office and updated my reports. I monitored the security cameras. At 1144 I resumed exterior patrols of the shopping center. I checked on a woman whose car was stalled in the parking lot. Roadside assistance arrived and I continued my patrols. At approximately 1226 hours the manager of a store at the shopping center informed me that a female was causing a disturbance outside of the store. I arrived onsite to find the woman yelling profanities, and witnessed her kick a customer’s vehicle; there appeared to be two other persons with her at the time. I confirmed that the store manager was on the phone with police, and notified my supervisor of the situation. While the police were on their way, I approached the suspect and asked her to stop kicking the vehicle and speak with me about the issue. The suspect calmed down, ceased any further aggressive action, and began to explain to me her situation. I let the suspect vent until the Police arrived at approximately 1248 hours. I provided the police my report, and they furnished me with the suspect’s personal information. I documented the damage to the vehicle in my report, and the police took the suspect into custody. When the police departed the premises, I updated the store manager and informed my supervisor that the situation had concluded. At 1332 hours, the two other persons left the property. At 1341 I returned to the security office, updated my reports and resumed monitoring security cameras.